Hello! I'm Sonia Leong, and I've worked as a Manga artist and writer in the UK for SelfMadeHero, Image, Hachettes, Walker Books, Tokyopop, Toyota, Marie Claire, Titan Comics, VIZ Media and more since 2004. I've also written tutorials and provided demonstrations for Letraset, Copic, Kuretake, Chameleon and Wacom. I'm part of Sweatdrop Studios, an independent publisher of original UK manga and comics. Within Sweatdrop, I've self published a variety of comics, light novels and artbooks. 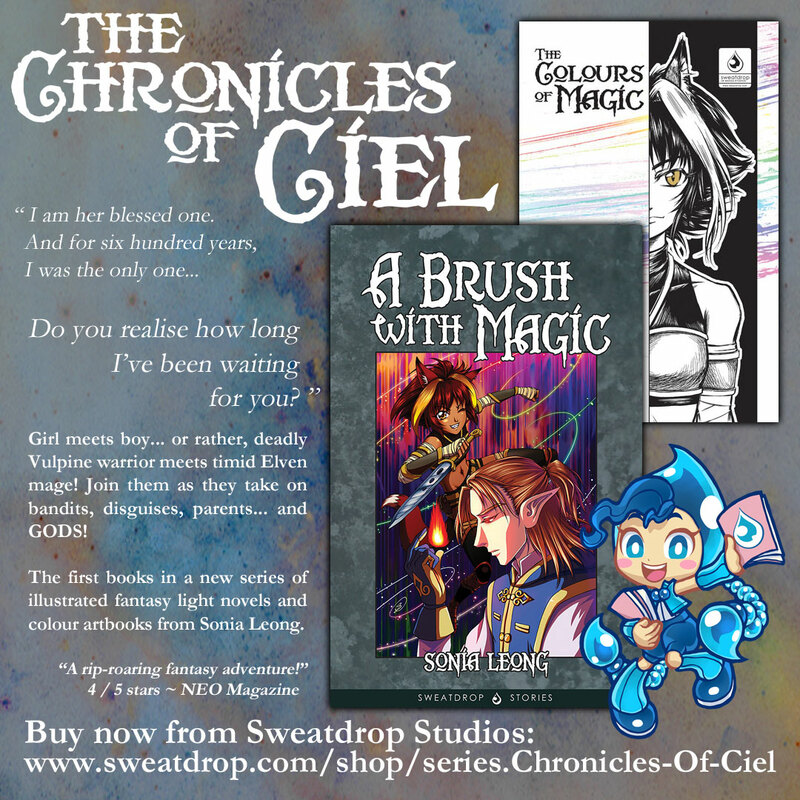 All of these books have received favourable reviews in UK's NEO Magazine and I've loved working on these, particularly my new fantasy series of light novels, The Chronicles of Ciel: A Brush With Magic. Supporting me on Patreon enables me to make more original work like this! Manga Mama is a comic strip I'm creating, loosely based on my experiences as a working, artist mum. The characters aren't myself and my family directly, but amusing versions of ourselves, so our names are similar, but not the same. Many people are curious about parenthood, particularly when one of the parents works as a creative professional from home. Juggling childcare and artwork is no easy task, but provides plenty of fodder for me to vent about XD I hope all parents out there will enjoy my musings. ❤ You will have Patron-only uploads of extra images and work-in-progress shots, mini tutorials and Q&A sessions/requests! ❤ I will email you hi-res wallpapers and finished pieces from my portfolio as I have time to create them! I may even digitally sign/personalise them to you! ❤ If I have your postal address, I will send you signed freebies every 3-4 months! ❤ You will receive a lovely pack in the post of either [3 x A5] or [2 x A4] prints signed by me after your first month! ❤ If I have your postal address, I will send you signed freebies every 2-3 months! ❤ You will receive a lovely pack in the post of either [2 x A3] or [2 x A4 + 2 x A5] signed prints from me after your first month! ❤ If I have your postal address, I will send you signed freebies every 1-2 months! Currently I am aiming to produce roughly 2 pages a month as I may need to prioritise other higher paying projects / work-for-hire, from juggling family and work. If I receive a high enough regular amount of pledges coming in, I can afford to devote more time to this project so that I can produce pages more often! Wonderful for everyone! More for us all to enjoy!